I used a decal sheet from Bison decals. 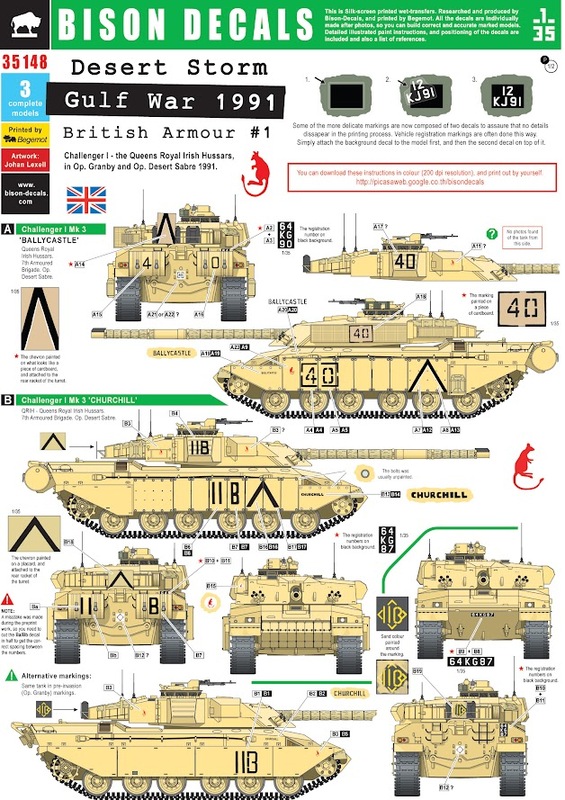 Specifically, markings for a Challenger 1 Mk 3 named “Ballycastle” of the Queens Royal Irish Hussars, 7th Armoured Brigade, in operation during the First Gulf War. I had to use different and slightly cut down chevrons on the rear of the side armour – the suggested decals would not fit, presumably because I had replaced the kit part with the Accurate Armour piece. They were very nice to work with – I would look to use this company’s products again. The decals were placed after spraying on Humbrol Clear. Citadel Purity Seal returned the model to a satin finish.